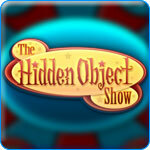 The Hidden Object Show Game Review - Download and Play Free Version! Here's Your Chance to Win 5 Million Dollars! How Far Will Your Searching Skills Get You On This Unique Game Show? Multiple 'Hint Chips' found on every level, in addition to three hints already provided at the beginning of each round. Objects are well hidden, perfect for the player seeking a challenge. Over twenty levels with three rounds per level ensures hours of play time. 'Skip Chips' to skip an undesired challenge. Applause after every item found and booing after every wrong attempt can become annoying. You're in the Spotlight! Can You Win Five Million Dollars? Become a contestant in a new game show! Search for special items to win five million dollars and tons of prizes! Feel the pressure of being on stage and listen to the cheering crowd as you search for a list of objects in cluttered rooms. Once you find all the objects, step up to the big wheel and take a spin to find out which mini game you'll be competing in next. There are 10 creative mini games to play. Enjoy spot the differences, find and replace, solving riddles to figure out which objects to find and a unique mini game where the scene is split into a grid and you must find certain sections of the grid that are shown at the bottom of the screen. Search for hints and chips that allow you to skip mini games you don't like. Rack up the prizes, from toasters to coffee makers to tons of money! What will you win next? With 30 unique scenes, 330 rounds and 10 mini games, this game will keep you busy for more than 15 hours! Enjoy the fun game show atmosphere with a cheering crowd and wisecracking host. With so many unique mini games, this game will keep your attention and stand out as a unique hidden object game! Can you become a millionaire? 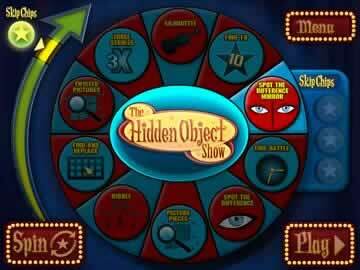 See how good your searching skills are now with The Hidden Object Show! 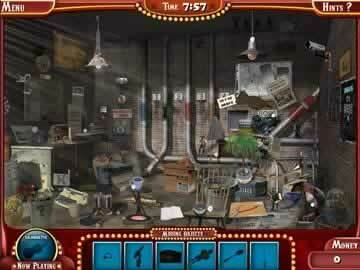 A refreshing break from the murder/mystery theme that seems to dominate hidden objects games, the Hidden Object Show is a mock old time game show that includes many distinct ways to hunt for hidden objects. On each level there are three rounds and each round is a different object hunting activity. With the use of a spinning wheel, the player will randomly land on a challenge to complete, in which objects may be presented as riddles, silhouettes, and many other things. Most of these challenges are a unique method of object hunting, and those that are not may be skipped using “skip chips,” which are earned by stopping on the “skip chip” portion of the wheel. With over twenty levels and an increasing number of rounds per level, this game guarantees hours of object hunting. However, the game falls somewhat short of exciting, perhaps due to the rigid level structure that easily becomes monotonous and at times boring. The Hidden Object Show is recommended to the player who loves object hunting with minimal other game components.